The Common Core State Standards are having a big impact on teaching and learning in the nation’s schools—and, not surprisingly, those academic guidelines also appear to be influencing district buying decisions, according to a recent survey. Research conducted by MDR, a company that analyzes the K-12 market, found that 68 percent of school systems plan to buy instructional materials that address the common core. That’s up from 62 percent the previous year. An even greater number of districts, 75 percent, said they hope to obtain free materials from the two main consortia creating tests aligned with the common core, the Partnership for Assessment of Readiness for College and Careers and the Smarter Balanced Assessment Consortium. That number remained unchanged. While Smarter Balanced provides resources to educators in its member states, it is also determined to stick to its primary role, which is to develop online assessments for the common core, said Joe Willhoft, the consortium’s executive director, in an e-mail to Education Week. Smarter Balanced is “careful not to get into common-core curricular materials or instructional strategies,” except as it relates to collecting and interpreting information on student performance, he explained. 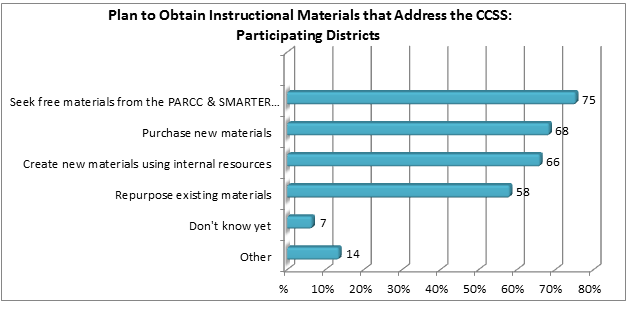 Many districts appear to be looking for help from within, with 66 percent indicating they plan to create new materials that address the standards using internal resources, up from 62 percent the previous year. The survey also found that 58 percent of districts said they plan to repurpose existing materials, an increase from 55 percent the year before, according to MDR. The information is based on a survey of school district officials, which is included in MDR’s State of the K-12 Market 2013 report. The full report is available at a cost from the company. As with many analyses of district spending, the results almost certainly require some interpretation. What’s hard to know is whether school systems were motivated primarily to spend based on the common core—or if they would have made those purchases, anyway, as part of the regular cycle of updating curriculum, lessons, and other resources, no matter which set of standards they were following. Another question goes beyond the parameters of the survey: are those materials actually aligned with the common core? A pair of researchers who are studying K-12 academic materials recently said their findings show that many districts buying materials stamped and sold as common-core-ready are actually getting hoodwinked a bit.